Apex Legends, Respawn Entertainment's free-to-play battle royale game, has seen huge success since its release on PC, PS4, and Xbox One in February earlier this year, but one playerbase has been curiously left out from partaking in the fun. 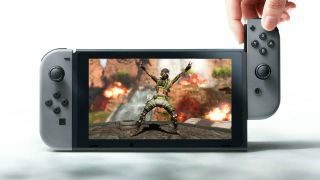 Despite it being the ideal game for quick-fire rounds on the daily commute, Apex Legends has not yet released on the Nintendo Switch, nor have Respawn or Nintendo announced any plans to bring the title to the portable platform. But Drew McCoy, Project Lead on Apex Legends, may have just teased a potential Switch port in the works, as part of a recent Twitter Q&A for Wired. Skip to the 7.15 part of the video, and you can find McCoy responding to a question about Apex Legends coming to Switch. "If Switch was coming, we would tell you and we would blast it across the world." says McCoy. "We are hearing all the Switch players who say they want the game. I can't make any promises right now. We have a lot of things that we're working on, so stay tuned for anything in the future. But currently we don't have anything to announce." I don't about you, but that answer very much sounds like the Respawn team is looking into a Switch port for its hit battle royale title, and why wouldn't they? Opening up the game to an even wider audience would only bring in more fame and glory (and profit) for the Apex Legends IP, as evidenced by Fortnite's success on the Switch platform so far. Hopefully we'll hear more concrete news soon but, for now, Respawn is gearing up to finally unveil its new action game Star Wars Jedi: Fallen Order this weekend. If you don't want to miss the big reveal, here's everything you need to know about how to watch Star Wars Celebration 2019 over the next two days. Discover more games like PUBG to play across PC, PS4, Xbox One, and Switch, or watch the video to discover the best Apex Legends weapons for achieving Victory Royale.